Spring has sprung and it’s time to celebrate! Spring has sprung and it’s time to celebrate in Wine Country! Sweet Sensations in the Hershey Harrisburg Wine Country will stimulate your senses as each participating winery puts their own unique touch on the new spring season! 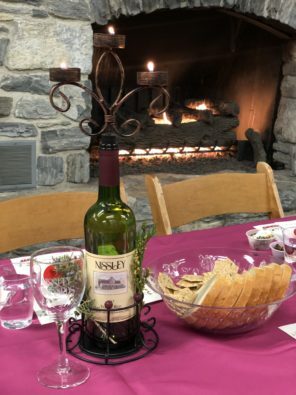 Enjoy fun food pairings with handcrafted wines, while you enjoy a relaxing drive through the rolling hillsides of Central Pennsylvania. In addition to the special pairings, each guest will receive a wine tasting, a souvenir glass, and a 10% discount off all wine purchased. Note: you will have to travel to each winery; this is not in one location. Your ticket will be good for all 6 days. During this three-weekend event, guests who travel the Wine Country and visit all of the participating wineries will be entered into a drawing to win the Sweet Sensations grand prize: a fully-stocked wine refrigerator filled with wine from all of the participating wineries! To qualify for the grand prize, simply turn your ticket in at the final winery of your visit! –> Please note: Cullari Vineyards, Royal Oaks, and SpringGate are not participating in this event. 1. This event requires guests to travel to the participating wineries (it is not in all one location). We encourage guests to have a designated driver, or contact our exclusive transportation partner Premiere #1 Limousine l, who will develop a custom experience. 2. Eventbrite will send you a confirmation email immediately after you have completed the transaction, but physical tickets will not be mailed to you. Instead, you must start at your chosen starting winery to get checked in and pick up the actual card stock ticket. Participating wineries will require that you have your actual cardstock ticket before you can begin enjoying this event. Printouts of the ticket purchase confirmation email do not qualify as tickets. 3. If you lose or break your glass, you will be able to purchase a new one for $3.00 at any of the wineries.